Classrooms are filled with students who can decode text but don't comprehend it. Reciprocal teaching addresses that problem by involving teachers and students in a conversation about text. 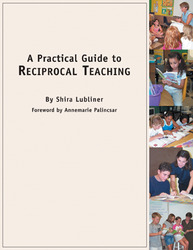 Author Shira Lubliner gives the teacher comprehensive information about this research-based method, as well as a step-by-step approach to implementation. 157 pages.